After increasing steadily from the mid-1990s through the mid-2000s, the rate at which the US is borrowing from the rest of the world - our current account deficit - has come down considerably. The current account deficit peaked at around 6% of GDP in 2006 and has hovered around 2.5-3% over the past several years. 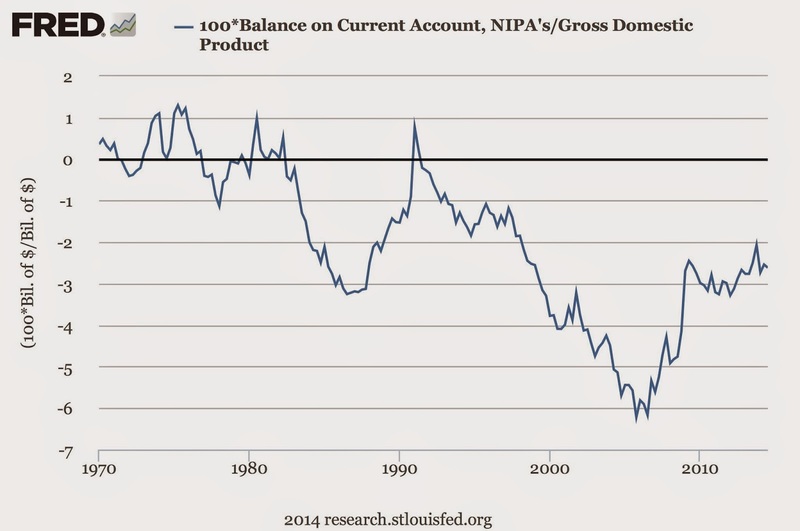 During the period when it looked like the US current account deficit was growing inexorably, there was quite a bit of discussion of "global imbalances" and whether or not the US' borrowing was sustainable. Despite years of borrowing, the US tends to earn a positive balance on income - i.e., the US receives more in payments on assets it owns abroad than it makes to foreign owners of US assets. Ricardo Hausmann and Federico Sturzenegger argued that national accounts understate the true value of US foreign assets. They called the gap between the accounting value and the true value "dark matter", which they largely attributed to the know-how exported (but not properly measured) with US FDI. (I revisited this idea in a previous post). ...For example, US multinational corporations sometimes over-invoice import bills or under-report export earnings to reduce their tax obligations. Again, this would work to overstate the recorded current-account deficit. While the efforts that US multinationals make to evade their tax obligations are probably technically legal in most cases, they go against the spirit of the US tax law, which taxes US corporations based on their global earnings (whether it should be this way is another matter). Since it arises from a gray area in our tax code, perhaps the we should call the resulting gap between our measured and true foreign assets "gray matter." A good report today from the BLS on employment in October: the unemployment rate fell to 5.8% (from 5.9%) and employers' payrolls rose by 218,000. The payroll figure comes from a survey of firms, while the unemployment rate is based on a survey of households (which has a smaller sample than the employer survey). The household survey figures look even better: the number of people employed rose by 683,000, and the number unemployed fell by 267,000. The labor force (i.e., people who are working or looking for work) rose by 416,000, which put the labor force participation rate at 62.8%, an increase from last month's historic low of 62.7%. This ratio increased from 76.7 to 76.9 in October. Overall, it shows some recovery over the past three years, but also gives an indication of why many Americans remain unhappy with the state of the economy - it is still less than halfway back from its low point to its pre-recession level. Moreover, while employment is improving, wages are still growing slowly - the BLS reports that average hourly wages have increased 2% over the past year. 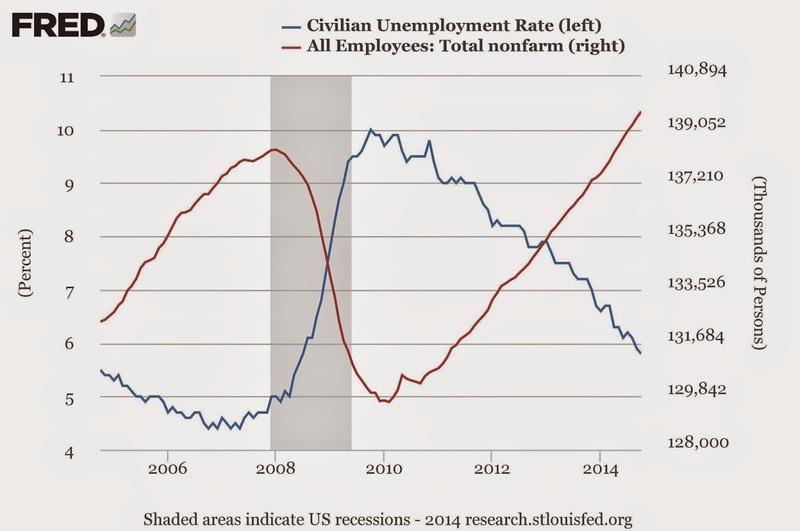 This suggests that there is still plenty of "slack" in the labor market. 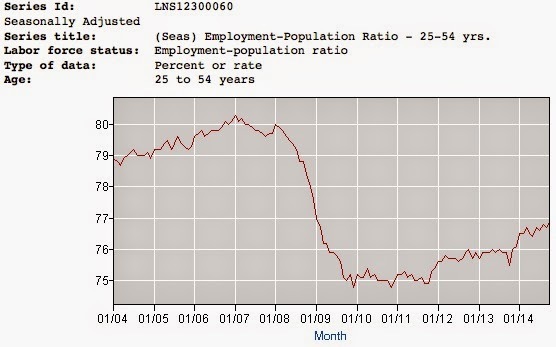 The BLS' broader measure of un- and under-employment, 'U-6', which includes the "marginally attached" and people working part-time who want to be full-time, is at 11.5%, down from 11.8% last month (it peaked at 17.2% in April 2010).